Me too. Anyone know what brand the shoes are on the first pic??? So cool. 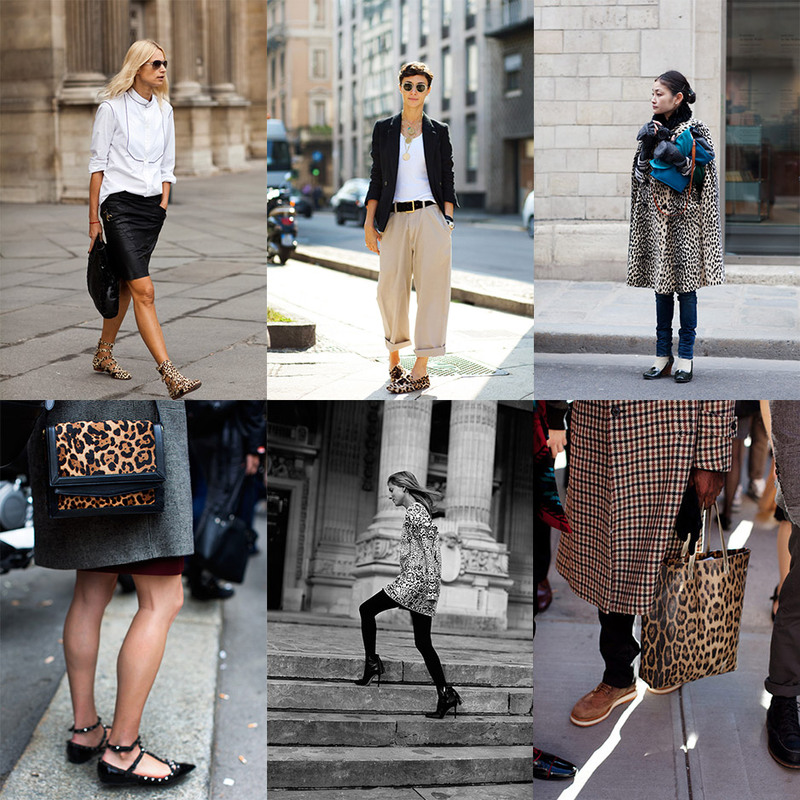 I love leopard printed details and Garance’s bag, mixed with Valentino shoes, is so cute! As I’ve said before, I am not always a fan of animal print. However these are impossibly chic! I really like the low key leopard print incorporated in accessories. The first look is to die for. The tailoring of the shirt is so interesting and clean. Love it. I am always thinking of leopard print. I could wear it every day! love the vibe in the top middle shot. nice confidence. I’m hardly thinking about it … positively. I think the problem with leopard print is it’s one of the very few fashion items that can go from perfectly right to horribly wrong FAST. A lot of times it’s worn in the wrong or (lazy) situations. You highlighted the leopard print ‘accents’ last week and I think those are brilliant touches. Even the coat this morning is cut well from a great material. Cheap leopard print on the other hand makes one look … well … cheap. But I have to say that cape/coat top right is rockin! Middle bottom photo – great! we are thinking about leopards!!!! A touch of leopard is always so beautiful! As for animal prints, I would wear shoes and/or scarves. I can’t picture myself in a printed coat, I would be overwhelmed ! Regardless of the current season, my absolute favorite are the leopard gladiator sandals. I adore leopard print detailing! That bag (bottom right) is to die for. Love Garance´ legs ! And the second look is perfect. I prefer animal touch on accessories like shoes, bags or scarf. Love all of them, leopard is always a good idea. i am such a sucker for this print! How many leopards had to die for these looks? :) jk I like all of them! Great inspiration looks! I especially find the plaid and leopard quite striking. I might do it with tartan even. Thanks for posting! I love your blog and spend far too many hours browsing! I crave photos of beautiful people with beautiful bags. Please, please add a bag category or please feature more shots with bags!! I adore the animal print bags in any shape and in any season–timeless. That leopard coat is gorgeous! My favorite – the third picture on top right. Classy! Deciding to rock leopard print is daring and oh so fashionable. Leopard yields tons of style and goes with everything. The more the pairing of patterns clash the better. These are some great looks all around – how can I check them out in their individual posts? I tried the ‘search’ function on ‘leopard print’ but it only came up with four results (none of the ones posted here) including a style portrait on Marina Laroude which, from all I could see, had no leopard prints in it . . ??? Great pictures and good catch! Love it in every one of the pics. It can definitely be overdone, but when done right, its great. I totally love leo prints! I love leopard print! It’s the new black. Love the shoes of the first and second photo. Whatever people say or fashion brings, i must say: i hate animal prints! It’s one of the last things i would wear. That and dungarees! Leopard print will always be chic and cool, I absolutely love it, in small touches like on the bag or as a sea of leopard like the coats! gorgeous. Leopard is such a great look. Bit with most things, too much of it is not good. Leopard is great. It gives every look something extra. The way the sunlight is shining in the first two photos puts me in a Spring time mood! Leopard print is such a great way to give more dimension to an outfit. I never stop thinking of leopard print. Worn in small quantities I find it really elegant. in my opinion all leopard print could disappear and the world we live in would be a much more beautiful place. Animal print must be done in moderation. Those shoes in the second, heavenly. the look with the loafers? insanely uncomplicated-chic. swoon. Leopard print done right! I’m tired of seeing some people decked out in tacky, colored leopard print. Leopard prints really are a science of their own. They can look both fantastic (top middle & right), and cheap & tacky (bottom left). Particularly love the bottom right leopard print bag. I’m not sure I would like it so much on its own, but it fits unexpectedly well with the masculine outfit. Conclusion – more men should embrace the leopard print! Wauw! I love the first look! The endless amount of tips I get from your blog! Thank you for inspiration! OMG, the shoes of the first pic are to die for!!!!!!! !